Who says pure vegetarian meals have to be complicated? You can whip up this fab, tasty lunch in five minutes! I usually caution against pre-packaged pure veg fare but Gardein has made it too easy and too good to resist. This chick'n is so close to the real thing, you won’t even know it’s not. Your body will thank you, too because Gardein is made from super-healthy grains like quinoa, and nutritious vegetable ingredients. Make the Gardein according to the package instructions. To assemble the sandwiches: Slice the ciabatta halves in half again, lengthwise. 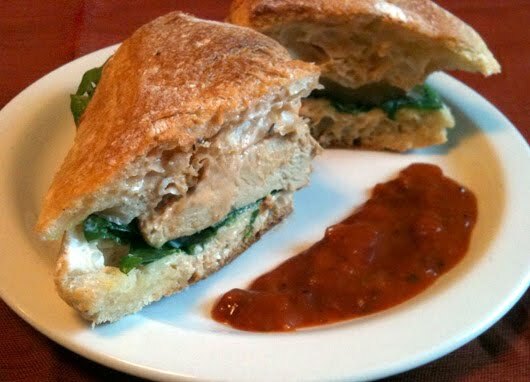 Drizzle olive oil on the inside of each piece of ciabatta, Lay a bed of two arugula leaves on the bottom ciabatta pieces of each sandwich and place a cooked Gardein breast on top (the breast will be coated with the tomato basil sauce that comes in the package). Cover with the top ciabatta pieces and serve each sandwich on a plate with the extra tomato basil sauce on the side for dipping.